Exterior of the courthouse in 1979. The State Parks Board was first made aware at its meeting on May 31, 1973, that the old courthouse in Florence was for sale. A preliminary investigation was made to determine what the costs might be to restore the structure. However, no action was taken until former Governor McFarland contacted the Chairman of the Parks Board, Dell Trailor. McFarland requested an opportunity to appear before the Parks Board at the December 10, 1974, meeting to make a presentation on the first courthouse in Florence. Governor McFarland, who had signed the legislation creating the State Parks Board, was introduced to the Board members. He found that Ricki Rarick, whom he had appointed to the first Parks Board, was still serving. McFarland spoke of the historical significance of the first courthouse in Florence. He had purchased the Courthouse for $8,000, and he now offered to donate the structure to the Board. He also pledged to give his personal collection, an endowment of $27,000, and to deposit $40,000 of Mountain States Telephone Bonds in the State Park Fund. The monies were to be used for the restoration and preservation of the courthouse. Following Governor McFarland’s presentation, the Parks Board unanimously approved the acceptance of the first Pinal County Courthouse as a State Historic Park. The Board also recognized Governor McFarland as one of Arizona’s most distinguished citizens and public officials, having served as County Attorney, Superior Court Judge, U.S. Senator, Majority Leader of the U.S. Senate, Governor of the State of Arizona, and finally, as Chief Justice of the Arizona Supreme Court. The first Pinal County Courthouse in Florence was built in 1878 and is one of the first courthouses constructed in Arizona. Levi Ruggles drew the plans for the courthouse that was constructed of locally made adobe blocks. The wood for the building was brought from northern Arizona by wagon. The Courthouse was enlarged in 1882 to provide additional offices and an upstairs for the sheriff’s quarters. The second courthouse, in Florence, was completed in 1891 and the county offices were moved. The first courthouse building was then converted into a hospital that served the County for almost 50 years. When the hospital moved, the old building was converted into a public health and welfare center. 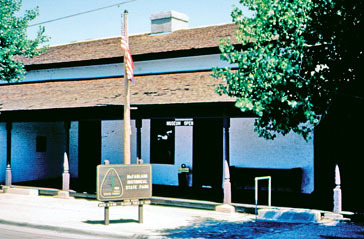 From 1968 to 1970 the building housed the Pinal County Historical Society Museum. The building was vacant until it sold to Governor McFarland at public auction in 1974. 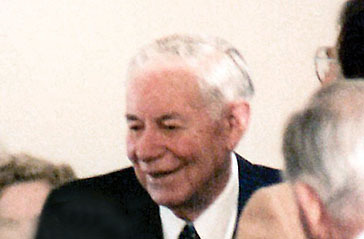 Govenor Ernest McFarland at the dedication ceremony in 1979. Ernest W. McFarland purchased and donated the building to the Parks Board for use as a museum. Monies from the McFarland donation and the State, funded the rehabilitation of the building. The rooms were returned to their original sizes and appearance. For the dedication ceremony, exhibits were prepared commemorating McFarland’s family history and his public service career. The Park exhibits tell two stories, one of the Courthouse and the area and one of Ernest W. McFarland. A new archive storage and restroom building was built on site in 1981. John Swearengin was selected as the first Park Manager. A dedication of the Park was held on December 4, 1977, at 2 P.M. Chairman of the Parks Board, Duane Miller served as Master of Ceremony. He introduced The Honorable Ernest W. McFarland, Dr. J.E. Wallace Sterling, Chancellor, Stanford University and Rose Mofford, Secretary of State. Following the dedication a tea hosted by the ladies of the Pinal County Historical Society was held at Governor McFarland’s restored historic home in Florence. On January 27, 1979, the Park’s official Opening Ceremony was held. Michael Ramnes, State Park Director, gave the welcome and introduced Parks Board Chairman, Josephine Bailey, who gave remarks on behalf of the Board and introduced Governor McFarland who spoke briefly of his appreciation to the Parks Board. Chairman Bailey then introduced Governor Bruce Babbitt who gave a great tribute to Governor McFarland and encouraged all to review the displays throughout McFarland State Historic Park. The history of the park's building provides visitors with a look into the past. The building represents a transition between Sonoran and Anglo-American architecture with its wood-shingled pitched roof surmounting traditional adobe brick walls. Like most buildings in Territorial Arizona, the original 1878 structure was constructed by hand using native materials. Soil from the area was used to make adobe bricks which were laid on a trench foundation filled with river rocks. All lumber for the floors and roof was hauled by wagon from northern Arizona.